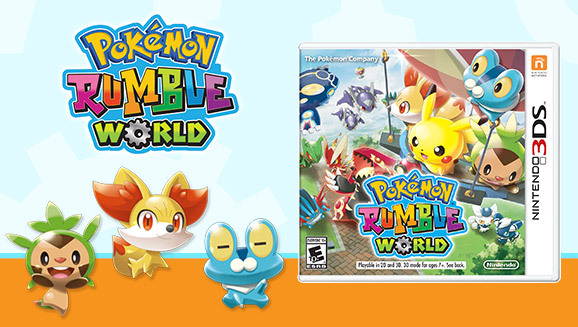 Just like in Europe and Japan, Pokemon Rumble World will be seeing a retail release in North America. This will launch on April 29. Pokemon Rumble World’s retail version ditches the in-game purchases. As soon as the tutorial ends, you’ll receive 3,000 Poke Diamonds and a Poke Diamond Digger at the in-game shop. Players will also be given 40 Poke Diamonds each day. Pokemon VIP Cards can be obtained in the in-game shop. The Balloon VIP card lets you inflate any hot-air balloon for a single Poke Diamond. Also, the Timing Stop VIP Card lets you use the Timing Stop to pick which stage you’d like to visit for only one Poke Diamond. You’ll need to acquire the Timing Stop before acquiring the Timing Stop VIP Card. Note that saved data cannot be transferred between the free-to-download and package versions. However, StreetPass and SpotPass functionality will work between the two games.